The official public HOA-approved community website is MeridianManor.com . This site you are viewing now, MeridianManor.info, is an unofficial site (operated by an enthusiastic resident). The official residents’ PRIVATE web site (password required) is at MeridianManorHoa.NabrNetwork.com . 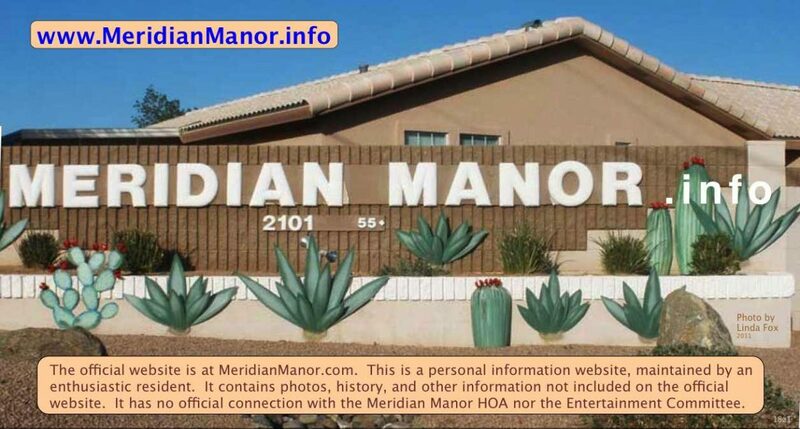 Please note all the following links have NO official connection with the Meridian Manor HOA. This website — MeridianManor.info — is an unofficial, resident-operated information site. Meridian Manor Facebook Group #1 — facebook.com/groups/271864772937340 (you need to be a resident to join and view this group). (you need to be a resident to join and view this group). Line Dance: MeridianManor.net (or MeridianManorDance.wordpress.com) — The 2017 Meridian Manor line dance step sheets page. Public Crime Map Online — RaidsOnline.com (Type in ‘2101 south meridian road, Apache Junction, AZ’ in address box at upper left, then click “Go to Address” button just below it. 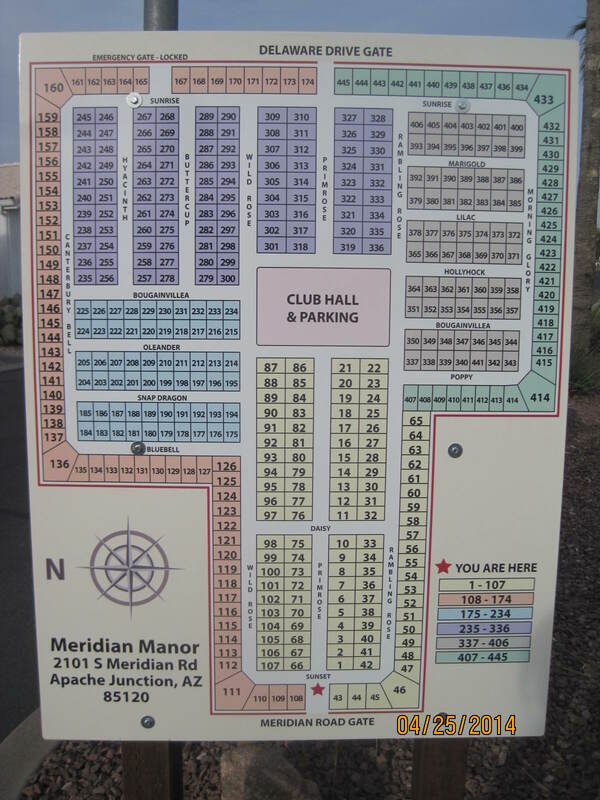 The Meridian Manor community is located at 2101 So. Meridian Road, Apache Junction, AZ 85120-7204. Contact information for the OFFICE is on the official MeridianManor.com website’s ‘Contact Us’ page. Walking Path images –Delaware to San Marcos — are in Photo Album 2.